Consultant Stan Leyenhorst of Universal Access Design Inc., a sub-contractor for the Rick Hansen Foundation, demonstrates YVR’s new CHECKITXPRESS baggage check designed with accessibility in mind and built by Glidepath of New Zealand. Most people take their airport access for granted, when it comes to dropping off their luggage, to finding their way to their gate, and even boarding their plane. But it was like mounting a polar expedition to travel anywhere for people who used a wheelchair. Now, thanks to consultants like Richmond's Stan Leyenhorst of Universal Access Design Inc., many barriers are being designed out of buildings. Plans, that aim at accessibility for all, employ what is called universal design. Thanks to the Vancouver International Airport Authority’s (YVR’s) Innovative Travel Solutions (ITS) team, CHECKITXPRESS makes it easier for everyone, whether in a chair or not, to do self-serve drop-off with their luggage before a flight. Subcontracting with the Rick Hansen Foundation, Leyenhorst reviewed the initial plans for the baggage check station. “One of the things was we advised on was making sure it was close enough to the ground,” says Leyenhorst. 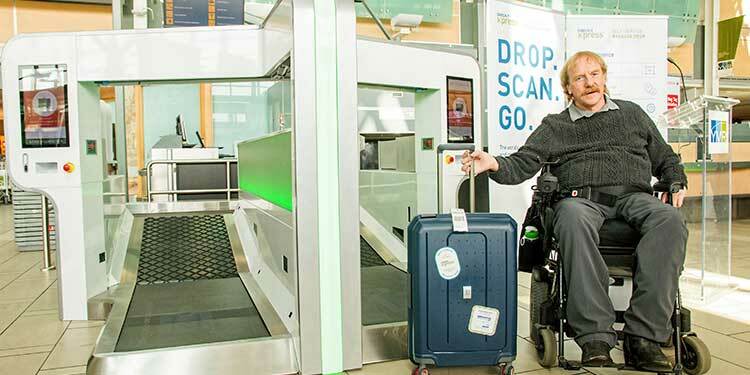 Now that the first model of the accessible baggage drop-off is in place and operating at YVR, Leyenhorst sees possibilities for future improvements with the little ramp to roll suitcases up to the conveyor belt. “With the next iteration, we are going to try to make it about an inch lower and make that angle shallower,” he says. Safety has also been designed into the CHECKITXPRESS system. “An other feature is, if you step on it it won’t go. The conveyor just stops,” he says. Leyenhorst keeps busy with his own consulting firm, UADI, for other companies, individuals and at the airport. “I do all the blue print reviews. I do the disability awareness and simulation training that YVR requires of all their employees. They are probably the most progressive company I’ve run into and the big reason is Craig Richmond.” Richmond is YVR’s president and CEO. Leyenhorst also consulted with a family construction company to build his own home without barriers. It means a home he can fully use without steps, or thick carpets that impede wheels plus a host of other features like doors wide enough to get his chair through and an accessible kitchen, bathroom and shower. “I am just about to launch the disability awareness training that Brad designed and I’m taking over. It’s called "Ramping Minds." Brad is also quadriplegic, almost as long as I have been,” says Leyenhorst. Sometimes the improvements take time and patience. Leyenhorst is consulting on the new Q-to-Q foot passenger ferry from Westminster Quay to Queensborough to make it wheelchair accessible. With a ramp that changes steepness with the tide and the need to chair tie-downs, making the ferry barrier-free takes ingenuity, and persistence. Being in a chair takes planning and patience for many things that are quick and easy for those without physical challenges. “That’s why I get up at six in the morning everyday because everything takes longer,” Leyenhorst says.